Our collection of Turkish and Portuguese cotton bath towels epitomize luxury. Made from 100% cotton to guarantee high absorbency and sumptuous softness, these towels are perfect for everyday use but are also a favorite of interior designers. Our towel collection is our take on classic Turkish towels which feature smooth cotton on one side and cozy, looped cotton on the other - for the ultimate in bathtime comfort. Available in a selection of lovely neutral shades, these beautiful bath towels would be at home in any home. For those seeking sophisticated style with a pop of color, we have just what you are looking for. 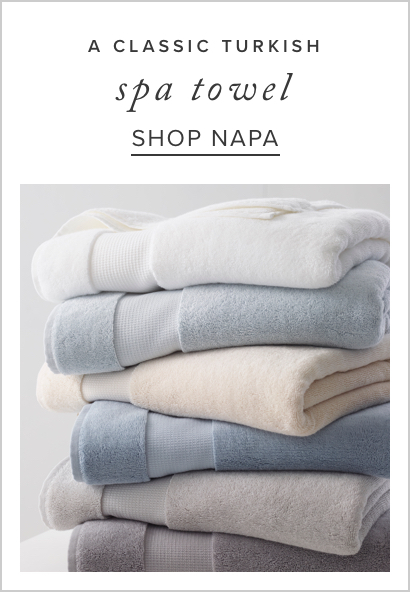 These luxury bath towels are made in Portugal with 700-gram weight cotton terry for maximum absorbency. Style our luxury bath towels with our designer bath rugs, shower curtains, and African baskets to complete the perfect bathroom look.